The MQ-510 quantum meter is designed for underwater PAR measurements and already applies the sensor's immersion effect correction factor to the meter readings through firmware. The meter provides excellent measurements under all light sources, including LEDs. The meter consists of a waterproof quantum sensor attached via waterproof cable to a handheld meter. The waterproof sensor incorporates a blue-enhanced silicon photodiode and custom optical filters with a rugged, anodized aluminum body with acrylic diffuser. The underwater quantum sensor is typically used in salt water aquariums where corals are grown. Note: The handheld meter is not waterproof, only the sensor and cable are waterproof. How is the MQ-510 different from previous Apogee quantum sensors? The MQ-510 performs exactly the same underwater as the MQ-500, but the MQ-510 simply multiplies the PAR reading by 1.32 to account for the immersion effect. 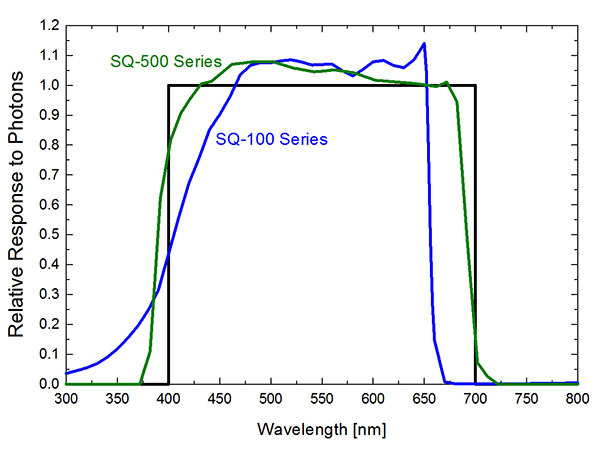 The MQ-510 is a full-spectrum quantum sensor (SQ/MQ-500 Series) with a spectral range of 389 to 692 nm ± 5 nm, which can be seen in the graph below. This improved spectral respose increases the acuracy of LED measurements. Where is the MQ-510 used? The MQ-510 is used to measure incoming PPFD in aquatic environments.